I got an email from Meskin scholar Steven Brower asking whether I had seen a piece from Prize Comics Western #78 with very odd art which Meskin seemed to have had a hand in. Very odd art indeed although it was not clear to me what, if any, part Meskin played in its creation. The art includes some Meskin looking traits most noticeably the simple angular eyebrows. There are other traits, however, that are untypical for Mort. For example the tall and lanky form given to the hero of the piece. Also some of the characters are done in a more cartoonish manner that look nothing like what I have seen in Meskin’s art. The inking is very distinctive as well. There is frequent use of what I call picket fence crosshatching (Inking Glossary). This is a technique often found in Simon and Kirby studio inking of Kirby’s pencils. The artist does the picket fence crosshatching in a very specific manner with the “pickets” largely confined to within “rail” lines and the “rails” being formed by a simple line almost like a wire. This picket fence variant is similar to that used by Meskin. Another unusual inking technique this artist uses is to use simple hatching (Inking Glossary) to provide volume to smoke or dust clouds. Most artist provide such clouds with simple billow lines and leave it to the colorist to provide volume with the use of a light color, usually light cyan. 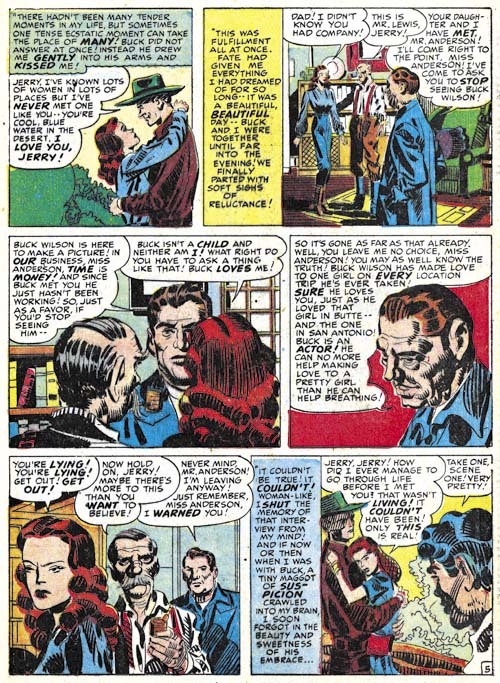 The very distinct inking found in “Showdown on the Chisholm Trail” brought to my mind another work published at about the same time, “The Perfect Cowboy” from Real West Romances #4. It is in fact the work of the same inker with the same techniques used in both stories. The same distinctive style of picket fence crosshatching and the same simple hatching used on dust clouds. 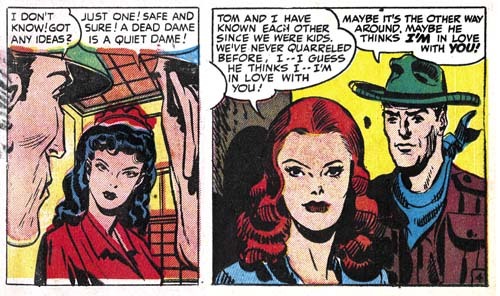 The only inking difference is that picket fence crosshatching was used on a woman’s hair in “The Perfect Cowboy” but that unusual hair inking was not done anywhere in the Prize Comic Western story. The similarities between the two stories are not limited to the inking but include the pencils as well. Most importantly the hero of both stories was drawn tall and thin. However there are differences between the artwork of two stories. While there are places in the PWC one that suggest Mort Meskin, in RWR it is Jack Kirby that comes to mind. In fact The Jack Kirby Checklist credits Kirby with the pencils and Simon with the inks. As I pointed out previously when discussing “The Perfect Cowboy (Chapter 8 of the Art of Romance) the inks were certainly not done by Joe. And the pencils sometimes show traits, like the tall lanky figures, that do not look at all like Kirby. 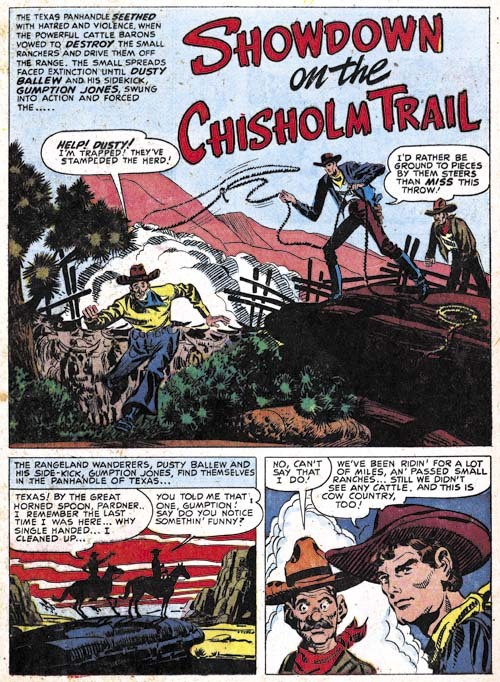 I am still inclined to believe that this artist was working from layouts; Kirby layouts in “The Perfect Cowboy” and those by Mort Meskin for “Showdown on the Chisholm Trail”. The layouts might have been tighter in some places more than others. I also suspect that either layouts were not provided for the entire story or the artist in question choose to ignore them in places. 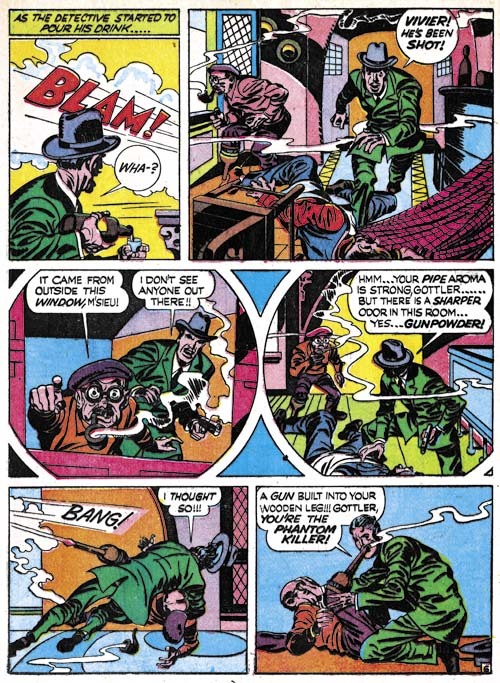 The picket fence crosshatching used in these two stories is more similar to Meskin than it is to Kirby or Simon. Further there is a complete lack of some studio style inking such as abstract arc shadows or drop strings and these brush techniques are also often absent from Meskin inking as well. So perhaps Mort gave the artists some pointers about inking as well. There is another artists that used a similar picket fence crosshatching although not as frequently and with a much coarser brush, Marvin Stein. Further Stein penciled women, at least early in his career, that look very much what is seen in both the stories discussed here. However I offer him up not as a candidate but as an object lesson. For Marvin was already working for Simon and Kirby at this time. The work that Stein did at this period was nothing like this unidentified artist. Marvin’s use of picket fence crosshatching started at a later period and he never inked dust clouds in the unusual manner described above. While Stein’s art had not yet reached his mature style some of his trademarks were already present and they do not appear in the PCW or the RWR stories. Nor did Marvin draw the same lanky figures. I am pretty confident that Stein was not our mystery artist. It just goes to show that attributions based on one or two traits must be viewed with caution. There are still a number of artist that worked with Simon and Kirby that I have not been able to identify so this mystery artist has company. Nor is he by any means the most talented of the unknowns, in fact I suspect he is just starting as a comic book artist. However he is so distinctive that I like to think that his name will eventually be uncovered.